First dates are nerve-racking—for everyone. Planning what you'll do, figuring out what to wear, and hoping that initial encounter isn't, well, awkward—it's all part of what makes meeting someone for the first time so stressful. But one way to reduce said stress and nerves is to wear something that you feel 100% comfortable in, and that's exactly where we come into play. We're here to help you plan and perfect your first-date winter outfits and provide you with easy-to-follow formulas you can always turn to when you find yourself in a dressing rut. We scoured our vast network of in-the-know fashion girls to pick out our favorite looks that are guaranteed to make a great, lasting impression when meeting someone for the first time. Ahead, see our roundup of cute first-date winter outfits; then shop our edit date essentials. 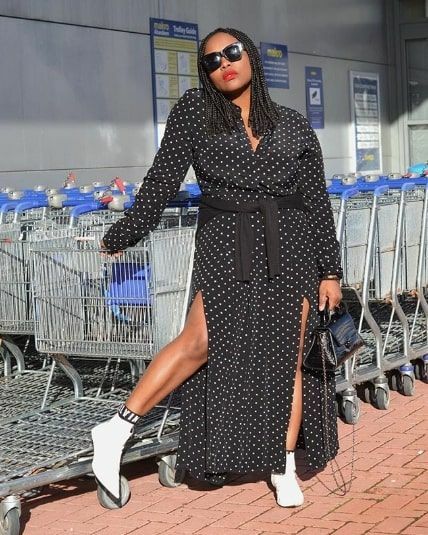 A polka-dot dress is a fun pick for a casual winter date. Try a sweater-and-skirt pairing for a chic first-date winter look. White pants and a sleek blouse make for a great first-date look you can wear for a casual coffee or a nighttime dinner. Try an LBD with knee-high boots. Or a maxi dress with slouchy white boots. Show off your fun side by pairing unexpected colors like lilac and bright red. An oversize sweater and jeans make a fail-proof first-date pick. Throw a moto jacket over this checkered miniskirt–and–white tee combo to make it slightly more weather-appropriate. For a casual daytime winter date, style your favorite jeans with a button-down blouse and black booties. This is a cute yet practical first-date outfit that's certain to impress. For a fancy dinner date, don your favorite midi dress and heels. Top off the look with a colorful coat. Wear this with blue jeans or black denim. Style this one with black sneakers. A wrap blouse you can easily dress up or down. A forever pair of jeans. Cool black boots that you can walk miles in. Next up, shop our roundup of casual dresses you can wear on a first date.